A self catering holiday to Sheringham and the surrounding area in North Norfolk offers a refreshing escape from the hustle and bustle of busy Britain. 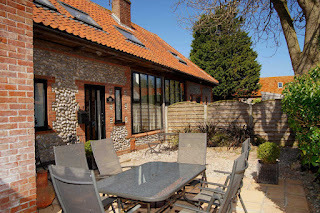 To truly enjoy your self catering break in this delightful area look no further than the tasteful barn conversion of Lower Byre, conveniently located in the sleepy coastal village of Weybourne, a short distance from Sheringham with Holt and Blakeney close by. Lower Byre offers perfect self catering accommodation for families and couples alike. It is situated in the centre of Weybourne village with the beach, shop, pub, restaurant and tea room all within a short walking distance of the property. Weybourne has a station which forms part of the Poppy Line – the North Norfolk Steam Railway operating between Sheringham and Holt. Weybourne is also home to the Muckleburgh Military Collection. A trip to see the seals on Blakeney Point should not be missed. Enjoy the show at the end of the Pier in Cromer. Lower Byre is an ideally situated self catering base enabling you to enjoy all that the area has to offer - the coast and its beautiful beaches, walking, bird watching, fishing, golf, sailing, pretty villages and relaxed towns with wonderful shops and restaurants plus all the many local tourist attractions.